April 28 2006 I picked up my husband for a biopsy and took him to an outpatient surgical center. While I was there waiting for the biopsy to be completed, I started noticing blood in my urine and major abdominal cramps. I left messages for several of my doctors on what I should do. I finally decided to see my PCP after I got my husband home. When Tom was done with his testing, his doctor took one look at me and asked if I wanted an ambulance. I said no, that I thought I could make it to the emergency room ok – Tom couldn’t drive because of the anesthesia they had given him. I barely made it to the ER and left the car with Tom to park. Tom’s doctor followed us to the ER and became my new doctor. The sight of blood in your urine is enough to make anyone panic. It doesn’t always indicate a serious problem, but it’s important you get it checked out with your doctor. Gross hematuria – This is when you can see blood in the urine. The urine may look pink, red, or cola-colored due to the presence of red blood cells (RBCs). Most of the time, other than the change in appearance in urine, most people do not have other symptoms. Microscopic hematuria – This is when you cannot see blood in the urine but it can be detected when examined under a microscope. Most people with microscopic hematuria have no symptoms. Medications – the anti-cancer drug cyclophosphamide (Cytoxan) and penicillin can cause urinary bleeding. Hematuria is diagnosed with a urine sample called a urinalysis. 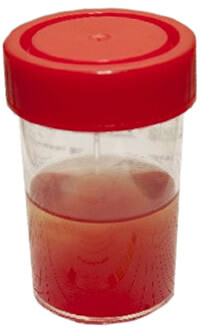 The urine sample is collected in a special container at a doctor’s office and usually tested in a lab for analysis. The lab technician places a strip of chemically treated paper called a dipstick in the urine. If RBCs are present, patches on the dipstick change color. When RBCs are noted, then the urine is further examined under a microscope to make the diagnosis of hematuria. Depending on the circumstances, the doctor may order further testing such as a urinalysis, blood test, biopsy, cystoscopy, or a kidney imaging test. Hematuria is treated by addressing its underlying cause. If no serious health problem is detected, no treatment may be necessary. If your hematuria is caused by a urinary tract infection, it will be treated with antibiotics. A urinalysis should be repeated within 6 weeks after antibiotic treatment ends to be sure the infection is gone. Dr. Samadi is a board-certified urologic oncologist trained in open and traditional and laparoscopic surgery and is an expert in robotic prostate surgery. He is chairman of urology, chief of robotic surgery at Lenox Hill Hospital and professor of urology at Hofstra North Shore-LIJ School of Medicine. He is a medical correspondent for the Fox News Channel’s Medical A-Team and the chief medical correspondent for am970 in New York City. Learn more at roboticoncology.com. Visit Dr. Samadi’s blog at SamadiMD.com. Follow Dr. Samadi on Twitter and Facebook. Are there any advantages to human growth hormone? A kidney cyst is a swollen, round, fluid-filled sac that develops on one or both of the kidneys. These cysts can be associated with serious conditions that affect the kidney’s ability to function, but usually they do not tend to cause complications and are referred to as simple kidney cysts. Simple kidney cysts differ from the ones that develop when a person has the genetic condition polycystic kidney disease (PKD). Simple cysts do not enlarge the kidneys, change their structure or reduce their function, as is the case in people with PKD. It is not fully understood what causes simple kidney cysts, although it is thought that obstruction of the tiny tubules within kidneys may be the cause and a deficient supply of blood to the kidney is suspected to play a role. Also, sacs that form on the tubules, referred to as diverticula, may detach from the tubule and become simple cysts. Whether or not genetics plays a role in the formation of these cysts has not yet been studied. Simple kidney cysts do not usually cause symptoms, damage to the kidney, or impair its function. However, if a cyst becomes large enough, it may cause pain between the ribs and hips and press on other organs. Sometimes, the cyst can become infected, in which case a person may develop a fever, as well as pain. A simple cyst that is causing pain or obstructing urine or blood flow through the kidney may need to be treated. A procedure called sclerotherapy is used, where the cyst is punctured with a long, thin needle and drained. For cysts that have become very large, a procedure called laparoscopy may be performed, where a surgeon drains and removes the cyst under the guidance of a fibre-optic instrument that helps view the cyst. PKD is a genetic condition characterized by the formation of numerous cysts on the kidneys. These cysts can cause significant enlargement of the kidneys and distort their normal structure, giving rise to chronic kidney disease and impaired kidney function. This condition can even lead to kidney failure. The cysts seen in PKD can also cause high blood pressure, vascular problems in the brain and heart, and liver cysts. PKD is caused by a gene mutation, which is usually inherited. The remaining cases are caused by a spontaneous gene mutation, where neither parent is a carrier of the mutation. Three different mutations have been discovered that are associated with PKD. These mutations affect proteins that are required for normal kidney development. There are two forms of PKD: autosomal dominant PKD (ADPKD) and autosomal recessive (ARPKD). These are described in more detail below. This is the most common type of inherited kidney disease, affecting about 12.5 million individuals worldwide. Cysts filled with a watery fluid form, proliferate and grow in both of the kidneys and often also in the liver and pancreas. Over time, the cysts eventually replace healthy tissue and cause loss of kidney function. Common symptoms include pain in the back and/or abdomen, hematuria, recurrent urinary tract infection, kidney stones, and kidney failure. This condition is inherited in a “dominant” fashion, which means that there is a 50% chance that an affected parent will pass the condition on to each child they have. This is a rare condition that occurs in around 1 in every 20,000 newborns. Around one in three babies born with this condition die within the first four weeks of their lives. Fluid-filled sacs form in the tubules of both kidneys and in the liver. Eventually, the cysts cause scarring or fibrosis that replaces the healthy tissue in these organs. If the fibrosis is severe enough, it can lead to kidney and liver failure. ARPKD is inherited in a “recessive” manner, that is, if both parents are carriers of this condition, there is a 25% chance that each of their children will be affected. The theme of this year’s World Blood Donor Day is “Blood connects us all”. It focuses on thanking blood donors and highlights the dimension of “sharing” and “connection” between blood donors and patients. In addition, the World Health Organization has adopted the slogan “Share life, give blood”, to draw attention to the roles that voluntary donation systems play in encouraging people to care for one another and promote community cohesion. 36 hours is all it takes for your body to replace blood that you donate. Celebrate #WorldBloodDonorDay on Tuesday, June 14. Blood connects us all. Polycystic kidney disease is a genetic disorder that causes numerous cysts to grow in the kidneys. A kidney cyst is an abnormal sac filled with fluid. PKD cysts can greatly enlarge the kidneys while replacing much of their normal structure, resulting in chronic kidney disease (CKD), which causes reduced kidney function over time. CKD may lead to kidney failure, described as end-stage kidney disease or ESRD when treated with a kidney transplant or blood-filtering treatments called dialysis. The two main types of PKD are autosomal dominant PKD and autosomal recessive PKD. PKD cysts are different from the usually harmless “simple” cysts that often form in the kidneys later in life. PKD cysts are more numerous and cause complications, such as high blood pressure, cysts in the liver, and problems with blood vessels in the brain and heart. A gene mutation, or defect, causes polycystic kidney disease. Genes provide instructions for making proteins in the body. A gene mutation is a permanent change in the deoxyribonucleic acid (DNA) sequence that makes up a gene. In most cases of PKD, a person inherits the gene mutation, meaning a parent passes it on in his or her genes. In the remaining cases, the gene mutation develops spontaneously. In spontaneous cases, neither parent carries a copy of the mutated gene. Researchers have found three different gene mutations associated with PKD. Two of the genes are associated with autosomal dominant PKD. The third gene is associated with autosomal recessive PKD. Gene mutations that cause PKD affect proteins that play a role in kidney development. Each cell contains thousands of genes that provide the instructions for making proteins for growth and repair of the body. If a gene has a mutation, the protein made by that gene may not function properly, which sometimes creates a genetic disorder. Not all gene mutations cause a disorder. People inherit two copies of most genes; one copy from each parent. A genetic disorder occurs when one or both parents pass a mutated gene to a child at conception. A genetic disorder can also occur through a spontaneous gene mutation, meaning neither parent carries a copy of the mutated gene. Once a spontaneous gene mutation has occurred, a person can pass it to his or her children. Read more about genes and genetic conditions in the U.S. National Library of Medicine’s (NLM’s) Genetics Home Reference External NIH Link. How common is polycystic kidney disease and who is more likely to have the disease? Polycystic kidney disease exists around the world and in all races. The disorder occurs equally in women and men, although men are more likely to develop kidney failure from PKD. Women with PKD and high blood pressure who have had more than three pregnancies also have an increased chance of developing kidney failure. Each child with a parent with an autosomal dominant mutation has a 50 percent chance of inheriting the mutated gene. Health care providers identify most cases of autosomal dominant PKD between the ages of 30 and 50.4 For this reason, health care providers often call autosomal dominant PKD “adult PKD.” However, the onset of kidney damage and how quickly the disorder progresses varies. In some cases, cysts may form earlier in life and grow quickly, causing symptoms in childhood. Polycystic kidneys enlarge along with the cysts, while roughly retaining their kidney shape. The cysts grow out of nephrons, the tiny filtering units inside the kidneys. The cysts eventually separate from the nephrons and continue to enlarge. The kidneys enlarge along with the cysts—which can number in the thousands—while roughly retaining their kidney shape. In fully developed autosomal dominant PKD, a cyst-filled kidney can weigh as much as 20 to 30 pounds. What are the signs and symptoms of autosomal dominant polycystic kidney disease? In many cases, PKD does not cause signs or symptoms until cysts are half an inch or larger. When present, the most common symptoms are pain in the back and sides—between the ribs and hips—and headaches. The pain can be temporary or persistent, mild or severe. Hematuria—blood in the urine—may also be a sign of autosomal dominant PKD. What are the complications of autosomal dominant polycystic kidney disease? Pain. Cyst infection, other types of urinary tract infections (UTIs), bleeding into cysts, kidney stones, or stretching of the fibrous tissue around the kidney because of cyst growth can cause pain in the area of the kidneys. High blood pressure. High blood pressure is present in about half of the people with autosomal dominant PKD and normal kidney function between the ages of 20 and 35.4 Almost 100 percent of people with kidney failure and autosomal dominant PKD have high blood pressure.1 High blood pressure—greater than 140/90 mm Hg—increases the likelihood of heart disease and stroke, as well as adding to the damage already done to the kidneys by the cysts. UTIs. Kidney cysts block the flow of urine through the kidneys. Stagnant urine can set the stage for infection. Bacteria enter the urinary tract through the urethra and spread up to the kidneys. Sometimes, the kidney cysts become infected. UTIs may cause scarring in the kidneys. Kidney stones. About 20 percent of people with autosomal dominant PKD have kidney stones.1Kidney stones can block the flow of urine and cause pain. Liver cysts. Liver cysts are the most common nonkidney complication of autosomal dominant PKD.1Liver cysts generally cause no symptoms. Pancreatic cysts. PKD can also cause cysts in the pancreas. Pancreatic cysts rarely cause pancreatitis—inflammation, or swelling, of the pancreas. Abnormal heart valves. Abnormal heart valves may occur in up to 25 percent of people with autosomal dominant PKD.1 Insufficient blood flow in the aorta—the large artery that carries blood from the heart—may result from the abnormal heart valves. Brain aneurysms. An aneurysm is a bulge in the wall of a blood vessel. Aneurysms in the brain might cause headaches that are severe or feel different from other headaches. Brain aneurysms can rupture, or break open, causing bleeding inside the skull. A ruptured aneurysm in the brain is a life-threatening condition and requires immediate medical attention. How do health care providers diagnose autosomal dominant polycystic kidney disease? Health care providers diagnose autosomal dominant PKD using imaging tests and genetic testing. Ultrasound uses a device, called a transducer, that bounces safe, painless sound waves off organs to create an image of their structure. An abdominal ultrasound can create images of the entire urinary tract or focus specifically on the kidneys. A specially trained technician performs the procedure in a health care provider’s office, an outpatient center, or a hospital. A patient does not need anesthesia. The images can show cysts in the kidneys. CT scans use a combination of x-rays and computer technology to create images. For a CT scan, a health care provider may give the patient an injection of a special dye, called contrast medium. CT scans require the patient to lie on a table that slides into a donutshaped device where the x-rays are taken. An x-ray technician performs the procedure in an outpatient center or a hospital. Adults do not need anesthesia. A health care provider may give infants and children a sedative to help them fall asleep for the test. CT scans can show more precise images of cysts in the kidneys. Magnetic resonance imaging (MRI) machines use radio waves and magnets to produce detailed pictures of the body’s internal organs and soft tissues without using x-rays. An MRI may include the injection of contrast medium. With most MRI machines, the patient lies on a table that slides into a tunnel-shaped device that is often open ended or closed at one end; some machines allow the patient to lie in a more open space. A specially trained technician performs the procedure in an outpatient center or a hospital. A patient does not need anesthesia, though a health care provider may use light sedation for people with a fear of confined spaces. A health care provider can use MRIs to measure kidney and cyst volume and monitor kidney and cyst growth, which can help track progression of the disorder. Kidney imaging findings vary widely, depending on a person’s age. Younger people usually have fewer and smaller cysts. Health care providers have therefore developed specific criteria for diagnosing the disorder with kidney imaging findings, depending on age. For example, the presence of at least two cysts in each kidney by age 30 in a person with a family history of the disorder can confirm the diagnosis of autosomal dominant PKD. A family history of autosomal dominant PKD and cysts found in other organs make the diagnosis more likely. The health care provider may refer a person suspected of having autosomal dominant PKD to a geneticist—a doctor who specializes in genetic disorders. For a genetic test, the geneticist takes a blood or saliva sample and analyzes the DNA for gene mutations that cause autosomal dominant PKD, called PKD1 andPKD2, or autosomal recessive PKD, called PKHD1. Personnel in specialized labs generally perform all genetic testing. A patient may not receive the results for several months because of the complexity of the testing. Genetic testing can show whether a person’s cells carry a gene mutation that causes autosomal dominant PKD. A health care provider may also use genetic testing results to determine whether someone with a family history of PKD is likely to develop the disorder in the future. Prenatal testing can diagnose autosomal recessive PKD in unborn children. Detection of a mutated gene cannot predict the onset of symptoms or how serious the disorder will be. Even if a health care provider finds a mutated gene, no specific cure for the disorder exists. People who are considering genetic testing may want to consult a genetics counselor. Genetic counseling can help family members understand how test results may affect them individually and as a family. Genetic counseling is provided by genetics professionals—health care professionals with specialized degrees and experience in medical genetics and counseling. Genetics professionals include geneticists, genetics counselors, and genetics nurses. Genetic counseling may be useful when a family member is deciding whether to have genetic testing and again later when test results are available. How do health care providers treat autosomal dominant polycystic kidney disease? Pain. A health care provider will first determine what is causing the pain and then recommend treatment. If cyst growth is causing persistent pain, the health care provider may first suggest over-the-counter pain medications such as aspirin or acetaminophen. People should consult their health care provider before taking any over-thecounter medication because some may be harmful to the kidneys. For most cases of severe pain due to cyst growth, surgery to shrink cysts can temporarily relieve pain in the back and sides. However, surgery does not slow the disorder’s progression toward kidney failure. High blood pressure. Keeping blood pressure under control can slow the effects of autosomal dominant PKD. Lifestyle changes and various medications can lower high blood pressure. Some health care providers recommend blood pressure medications called angiotensin-converting enzyme (ACE) inhibitors or angiotensin receptor blockers (ARBs). Health care providers have found these medications to protect the kidneys in people with other forms of kidney disease besides autosomal dominant PKD. Sometimes a patient can control blood pressure through diet and exercise alone. UTIs. People with autosomal dominant PKD tend to have frequent UTIs, which health care providers treat with antibiotics. People with the disorder should seek treatment for a UTI immediately because infection can spread through the urinary tract to the kidney cysts. Cyst infections are difficult to treat because many antibiotics do not reach the cysts. Kidney stones. Treatment of kidney stones in people with autosomal dominant PKD is similar to treatment in people without the disorder. Potassium citrate, taken by mouth, is useful for treating the types of kidney stones associated with autosomal dominant PKD. Breaking up stones with shock waves and removing stones through a small incision do not cause more complications in people with autosomal dominant PKD than in people without the disorder. Liver cysts. Most people with liver cysts do not need treatment. A health care provider may aspirate—drain with a needle through the skin—liver cysts in people who have symptoms. In the most severe cases, a patient may need a liver transplant. Infections in liver cysts can be treated with antibiotics and aspiration. Pancreatitis. Treatment for pancreatitis usually involves a hospital stay with intravenous (IV) fluids and antibiotics. Abnormal heart valves. Abnormal heart valves in people with autosomal dominant PKD rarely require valve replacement. A patient may need further tests if a health care provider detects a heart murmur—a blowing, whooshing, or rasping sound heard with a stethoscope during a heartbeat. 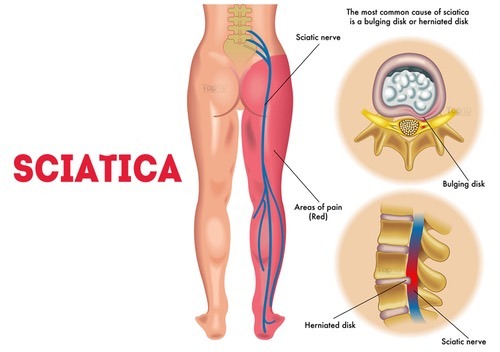 Diverticula. A high-fiber diet and pain medications help relieve symptoms when diverticula are present. Uncomplicated infection of the diverticula with mild symptoms usually requires the person to rest, take oral antibiotics, and be on a liquid diet for a period of time. Sometimes an infection is serious enough to require a hospital stay, IV antibiotics, and possibly surgery. Brain aneurysms. People with autosomal dominant PKD should see a health care provider if they have severe or recurring headaches—even before considering over-the-counter pain medications. Small aneurysms rarely require surgery. A person with a brain aneurysm should avoid smoking and control blood pressure and lipids—fats in the blood. What is autosomal recessive polycystic kidney disease? Autosomal recessive PKD is a rare genetic disorder that affects the liver as well as the kidneys. The signs of autosomal recessive PKD frequently appear in the earliest months of life, even in the womb, so health care providers often call it “infantile PKD.” In an autosomal recessive disorder, the child has to inherit the gene mutation from both parents to have an increased likelihood for the disorder. The chance of a child inheriting autosomal recessive mutations from both parents with a gene mutation is 25 percent, or one in four. If only one parent carries the mutated gene, the child will not get the disorder, although the child may inherit the gene mutation. The child is a “carrier” of the disorder and can pass the gene mutation to the next generation. Genetic testing can show whether a parent or child is a carrier of the mutated gene. Autosomal recessive disorders do not typically appear in every generation of an affected family. The chance of a child inheriting autosomal recessive mutations from both parents with a gene mutation is 25 percent, or one in four. Read more about how people inherit genetic conditions at the NLM’s Genetics Home ReferenceExternal NIH Link. What are the signs and symptoms of autosomal recessive polycystic kidney disease? An early sign of autosomal recessive PKD is an enlarged kidney, seen in a fetus or an infant using ultrasound. Kidney function is crucial for early physical development, so children with autosomal recessive PKD and decreased kidney function are usually smaller-than-average size, a condition called growth failure. Some people with autosomal recessive PKD do not develop signs or symptoms until later in childhood or even adulthood. What are the complications of autosomal recessive polycystic kidney disease? Babies with the most severe cases of autosomal recessive PKD often die hours or days after birth because they cannot breathe well enough to sustain life. Their lungs do not develop as they should during the prenatal period. Pressure from enlarged kidneys also contributes to breathing problems. Children born with autosomal recessive PKD often develop kidney failure before reaching adulthood. Liver scarring occurs in all people with autosomal recessive PKD and is usually present at birth. However, liver problems tend to become more of a concern as people with autosomal recessive PKD grow older. Liver scarring can lead to progressive liver dysfunction and other problems. Additional complications of autosomal recessive PKD include high blood pressure and UTIs. How do health care providers diagnose autosomal recessive polycystic kidney disease? Health care providers diagnose autosomal recessive PKD with ultrasound imaging, even in a fetus or newborn. The test can show enlarged kidneys with an abnormal appearance. However, a health care provider rarely sees large cysts such as those in autosomal dominant PKD. Ultrasound imaging can also show scarring of the liver. How do health care providers treat autosomal recessive polycystic kidney disease? Enlarged kidney. No treatment to prevent or reverse kidney enlargement is available. A patient may need removal of one or both kidneys if pressure from the enlarged kidneys makes breathing impossible. Children with removed kidneys must receive dialysis or a kidney transplant. Growth failure. A health care provider should address physical development through nutritional therapy. In severe cases of growth failure in children, a health care provider may consider human growth hormone. Breathing problems. Health care providers treat infants with breathing problems with artificial ventilation and, in urgent cases, resuscitative efforts, such as artificial respiration and heart massage. Kidney failure. Peritoneal dialysis is the preferred method of treating children with kidney failure, although health care providers also use hemodialysis. Kidney transplantation may be limited in infants because of their size. High blood pressure. A health care provider can help control blood pressure with medications. UTIs. A health care provider can treat UTIs with antibiotics. Liver disease. If serious liver disease develops, some children may need to undergo combined liver and kidney transplantation. Can a person prevent polycystic kidney disease? Scientists have not yet found a way to prevent PKD. However, people with PKD may slow the progression of kidney damage caused by high blood pressure through lifestyle changes, diet, and blood pressure medications. People with PKD should be physically active 30 minutes a day most days of the week. See “Eating, Diet, and Nutrition” for diet advice on lowering blood pressure and slowing the progression of kidney disease in general. If lifestyle and diet changes do not control a person’s blood pressure, a health care provider may prescribe one or more blood pressure medications, including ACE inhibitors or ARBs. A dietitian specializes in helping people who have kidney disease choose the right foods and plan healthy meals. People with any kind of kidney disease, including PKD, should talk with a dietitian about foods that should be added to their diet and foods that might be harmful. PKD may require diet changes for blood pressure control. Kidney disease in general also calls for certain diet changes. More information about the DASH eating planExternal NIH Link is available from the National Heart, Lung, and Blood Institute. As your kidneys become more damaged, you may need to eat foods that are lower in phosphorus and potassium. The health care provider will use lab tests to watch your levels. People with CKD may need to watch how much protein they eat. Everyone needs protein. However, protein breaks down into wastes the kidneys must remove. Large amounts of protein make the kidneys work harder. High-quality proteins such as meat, fish, and eggs create fewer wastes than other sources of protein. Beans, whole grains, soy products, nuts and nut butters, and dairy products can also be good sources of protein. Most people eat more protein than they need. Eating high-quality protein and smaller portions of protein can help protect the kidneys. The National Kidney Disease Education Program offers a series of easy-to-read fact sheets about nutrition for people with CKD. 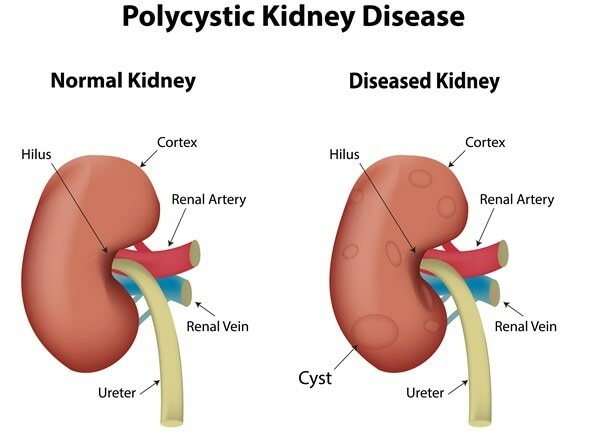 Polycystic kidney disease (PKD) is a genetic disorder that causes numerous cysts to grow in the kidneys. A gene mutation, or defect, causes polycystic kidney disease. Autosomal dominant PKD is the most common form of PKD and the most common inherited disorder of the kidneys. Health care providers identify most cases of autosomal dominant PKD between the ages of 30 and 50. The most common symptoms of PKD are pain in the back and sides—between the ribs and hips—and headaches. The pain can be temporary or persistent, mild or severe. Hematuria—blood in the urine—may also be a sign of autosomal dominant PKD. A health care provider diagnoses autosomal dominant PKD using imaging tests and genetic testing. Although a cure for autosomal dominant PKD is not currently available, treatment can ease symptoms and prolong life. Autosomal recessive PKD is a rare genetic disorder that affects the liver as well as the kidneys. A health care provider diagnoses autosomal recessive PKD with ultrasound imaging, even in a fetus or newborn. Treatments for autosomal recessive PKD focus on the symptoms and complications. Scientists have not yet found a way to prevent PKD. However, people with PKD may slow the progression of kidney damage caused by high blood pressure through lifestyle changes, diet, and blood pressure medications. People with any kind of kidney disease, including PKD, should talk with a dietitian about foods they should add to their diet and foods that might be harmful. 1Torres VE, Grantham JJ. Cystic diseases of the kidney. In: Taal MW, ed. Brenner and Rector’s The Kidney. 9th ed. Philadelphia: Saunders; 2011:1626–1667. 2United States Renal Data System. 2012 Annual Data Report: Atlas of Chronic Kidney Disease and End-Stage Renal Disease in the United States. Vol. 2. Bethesda, MD: National Institute of Diabetes and Digestive and Kidney Diseases; 2013. 3Audrézet MP, Cornec-Le Gall E, Chen JM, et al. Autosomal dominant polycystic kidney disease: comprehensive mutation analysis of PKD1 and PKD2 in 700 unrelated patients. Human Mutation. 2012;33(8):1239–1250. 4Pope JC. Renal dysgenesis and cystic disease of the kidney. In: Wein AJ, ed. Campbell-Walsh Urology. 10th ed. Philadelphia: Saunders; 2012: 118e1–118e46. 5Diet and lifestyle changes. National Kidney Disease Education Program website.http://nkdep.nih.gov/living/diet-lifestyle-changes.shtml. Updated September 17, 2014. Accessed September 23, 2014. This information may contain content about medications and, when taken as prescribed, the conditions they treat. When prepared, this content included the most current information available. For updates or for questions about any medications, contact the U.S. Food and Drug Administration toll-free at 1-888-INFO-FDA (1-888-463-6332) or visit www.fda.govExternal Link Disclaimer. Consult your health care provider for more information. 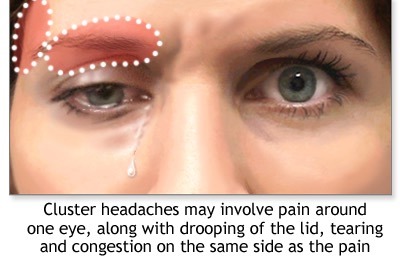 Cluster Headache is one of the most painful types of headaches. It’s frequently described as pain that occurs around, behind, or above the eye and along the temple in cyclic patterns or “clusters.” There are more than 200,000 cases of Cluster Headaches in the U.S. per year, and many patients describe it as a “drilling” type of sensation. Right now, a local clinical research study is testing an investigational medication to see if it may help people who suffer from cluster headache (Investigational means the medication isn’t approved for routine clinical use). If you qualify for this research study, you may have the opportunity to try this investigational medication. You may also receive study-related care at no cost, and compensation may be provided.